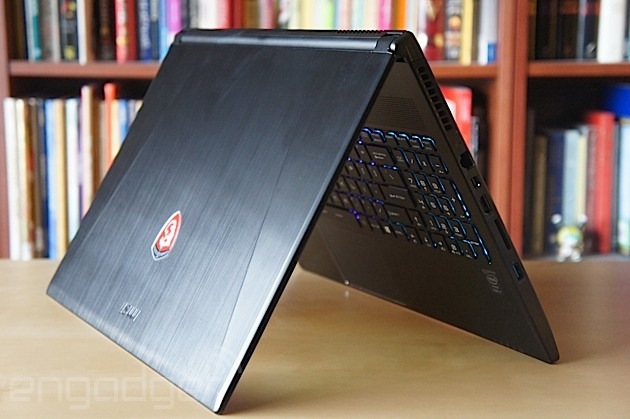 Which gaming laptops are worth buying? It's the natural order of things: NVIDIA releases a new line of mobile GPUs and suddenly the market is flooded with new gaming laptops. It is spring, after all. Most notebooks in the category follow a standard form, but every now and then someone breaks the oversized, hulking mold. This year, it's MSI. Until now, the company's lightweight series consisted of one machine, the GS70 Stealth. It was praised for being thin, light and having a more premium feel than most gaming laptops, but its 17-inch screen still made it unwieldy. Enter the GS60 Ghost: everything you loved about the Stealth, but with a 15-inch display and -- wouldn't you know it -- NVIDIA's new GeForce GTX 800M series GPU. Let's see how it stacks up. The GS60 Ghost is a slim and powerful option for gamers who want a lightweight rig. If you're going to spend that kind of money, though, wait for the unreleased GS60 Ghost Pro, which will bring a sharper display and better graphics. How would you rate the GS60 Ghost? There's a new fad trending in the world of gaming laptops, and we like it: thin, light and simple. Three years ago, you'd have been hard-pressed to find a gaming rig that fit those adjectives, but they're perfectly suitable for the GS60 Ghost. Save for a few manufacturer logos, a silver-accented mousepad and a small, angular shelf surrounding the keyboard, this laptop is as plain as they come. There are no gaudy color schemes, aggressive shapes or unnecessary embellishments -- just a lightly brushed, black magnesium-alloy chassis. This simple elegance doesn't cripple the device's connectivity options, either -- Ethernet, Mini DisplayPort and HDMI sockets run down the laptop's right edge, accompanied by an SD card reader and a USB 3.0 port. Two more USB 3.0 connections fill out the device's left side, flanked by a pair of audio jacks and the machine's AC adapter. Air vents circle around the back of the GS60's slim 0.78-inch frame, quietly teasing the graphical prowess hidden within. 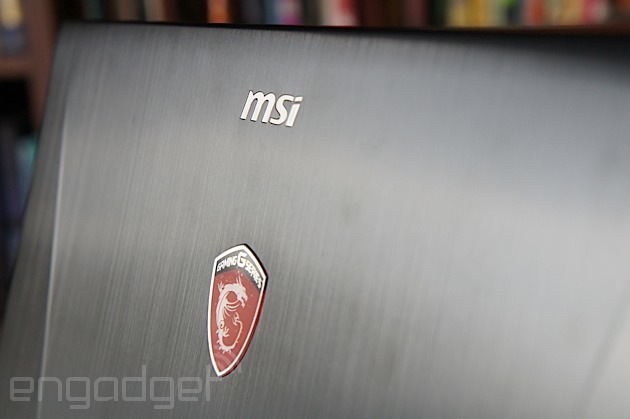 All in all, if it weren't for MSI's Dragon Army branding on the lid, the GS60 Ghost could easily be mistaken for a 15-inch Ultrabook. While the notebook's metal frame lends it the countenance of a sturdy, well-built machine, it also makes it an easy target for scratches -- which is probably why MSI ships a soft, zippered case with every unit. The protective sleeve is only lightly padded, but it's a nice freebie nonetheless. There is one element of the Ghost's design that put us off: the keyboard. There's nothing wrong with its full-sized chiclet layout, and it's certainly not missing any key functions, but the keycaps are marred by an ugly, sharply angled and slightly oversized font. Fortunately, almost everything else about the keyboard overshadows its cosmetic faults. 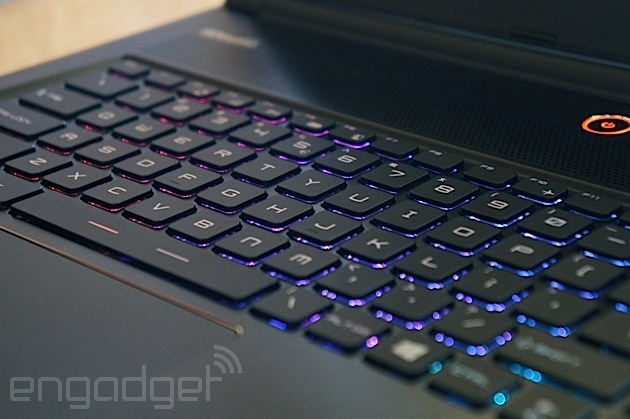 Most gaming laptops feature keyboards with a faint, multicolored backlight, usually controlled through a desktop application. So does the GS60, but it takes things a step further: The notebook's SteelSeries-sourced keyboard gives users control over not just the robust LED backlight, but also the specific function of each individual key. The included SteelSeries Engine can reprogram any key (except F1-F12) to launch applications, run customized macros or simply emulate a different keyboard function. Custom profiles can be configured to automatically launch with specific games or applications too, and can be visually differentiated by custom backlight configurations. It makes for a decent typewriter too, though the keys could stand to have a little more travel. We were a little surprised to find a buttonless, clickable trackpad -- common for Ultrabooks and productivity machines, but extremely rare for gaming rigs. MSI's implementation seemed stiff and awkward at first; it tracks fingers well enough, but only right-clicks if you press down in the lower-right-hand corner. Turn on multi-touch gestures and two-finger clicking, however, and the pad blossoms into a productivity wunderkind. 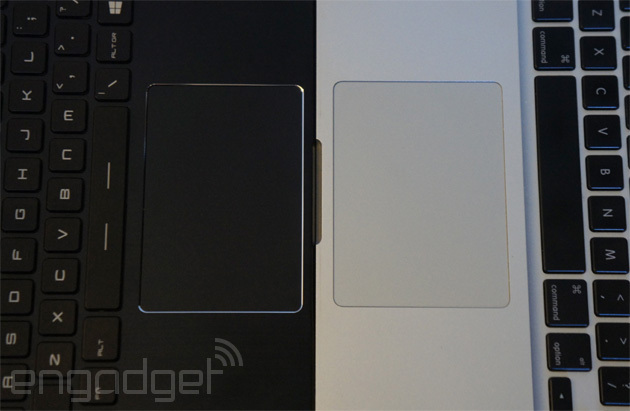 Properly configured, the Ghost's trackpad is excellent for general use. Unfortunately, it's on a gaming laptop. Trackpads make poor game controllers as a general rule, but clickable trackpads are particularly ill-suited to the task. Since both mouse buttons are integrated into the same clickable surface (differentiated only by an assigned area or how many fingers are being used), only one can be activated at a time. The problem? Many games require the player to move the mouse while simultaneously using both mouse buttons -- aiming down the scope in a first-person shooter, for instance. Trying to depress the pad while using it to move a character is also extremely awkward. Overall, it's a great mouse, but terrible for game input. Wide viewing angles, bright colors and a non-reflective, matte screen: everything we want in a laptop display and exactly what the GS60 has to offer. 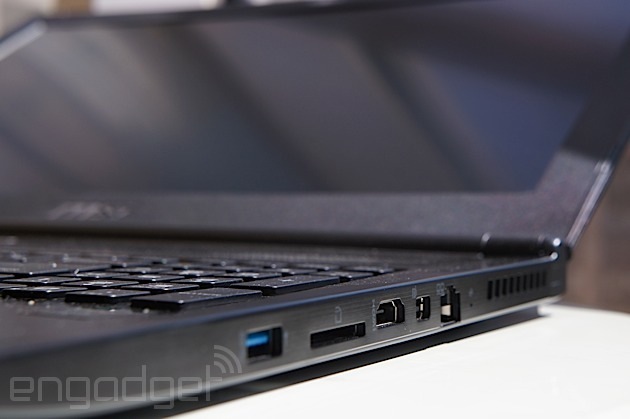 It's a relief too: Far too many gaming laptops ship with panels that lose their luster when viewed off center. MSI claims the Ghost's 15.3-inch panel will display accurate colors to any viewer within 85 degrees of the screen, and while we didn't exactly whip out a protractor, we'll admit the display stayed vibrant no matter what angle we tried. All told, it's bright, beautiful and glare-free. There isn't much else to say. While it's not uncommon for notebooks to lean heavily on audio software to get the most out of their tinny speakers, the GS60's tin cans seem to use the drivers as a crutch. Without the aid of the included Sound Blaster Cinema equalizer, the Ghost's audio has all the fidelity of an AM radio. Properly filtered, they don't sound bad, per se, but for speakers proudly flaunting Dynaudio branding, they're resoundingly average. Still, they do more than a passable job when tuned to the software's default settings: They don't distort, crackle or buzz at high volumes, for example. There's nothing wrong with them, really; we just expected more. Looking forward to seeing how NVIDIA's new GPU architecture (codenamed Maxwell) performs? You'll have to wait a little longer. NVIDIA has a habit of outfitting its mobile chips with a mixture of new and old architectures, and its new 800M series is no exception: The GeForce GTX 860M at the GS60's core happens to have both Maxwell and Kepler variants, differentiated by clock speed and total core count. NVIDIA says the two chips should perform on the same level -- but it's worth noting that MSI's Ghost is outfitted with the GPU's Kepler silicon. Even so, last year's GPU architecture doesn't seem to be much of a hindrance: The GS60 Ghost consistently walked the line between ultra and very high graphic settings, with few games struggling to reach playable frame rates at maximum settings. Saints Row IV, Thief and Battlefield 4 all maintained a 30 fps average at ultra high quality, with their lowest frame counts staying in the high twenties. BioShock Infinite did even better; it held a 44 fps average on its highest graphics settings. Even The Witcher 2, a game known for taxing GPUs, toed the line: 33 frames per second at its maximum setting (with the GPU-killing ubersambling option disabled, of course). Naturally, Crysis 3 struggled to hit playable frame rates without significant concessions (we had to scale it back to medium to hit 30 fps), but struggling with Crysis is par for the course anyway, right? Still, we can't help but wonder if we're missing out for the sake of last year's architecture. NVIDIA announced the GeForce GTX 800M series with a new feature that promises to extend a laptop's on-battery playtime by 50 to 100 percent. The Ghost gave itself up after just 52 minutes of gameplay, which is about average -- far below the doubled runtime NVIDIA promises. In fact, the GS60's high-performance runtime was only on par with the 50-minute average NVIDIA is trying to extend. The feature, called Battery Boost, uses NVIDIA's GeForce Experience software to match game performance to a target frame rate. Indeed, the Ghost did limit its output to 35 fps when disconnected from its AC adapter, but it didn't translate into more gameplay. It was also a fairly inconsistent experience, and would drop to a choppy 15 fps average for extended periods of time. The Ghost's Ultrabook stylings don't lend it any traditional longevity either: Engadget's standard battery test exhausted the rig in three hours and 13 minutes. That's about average for a modern gaming laptop, but it falls short of long-lasting outliers like Razer's third-generation Blade. Frankly, it's what we expected out of the Ghost, but gamers looking for a machine to pull double-duty at the office may want to look for something more longevous. Once upon a time, laptops and pre-built computers came riddled with bloatware, off-brand software packages and thinly veiled advertisements disguised as "free trials." It's just the way it was. This unpopular trend has been dying off in recent years, however, and we're happy to report that the GS60 Ghost features only two offenders: the ever-present Norton security suite and XSplit Gamecaster. The former is easily (and traditionally) ignored, but the latter may be worth the attention of wannabe Twitch superstars. It's a gameplay-broadcasting suite, complete with chat integration, webcam-overlay options and even annotation tools. That said, it's only a demo; if you're interested in hosting a watermark-free stream at a decent resolution, it'll cost you $15. Just about everything else on the Ghost's internal storage is a complement to its hardware, including the aforementioned GeForce Experience (which also offers capture and streaming options, by the way), Sound Blaster Cinema 2 and SteelSeries Engine suites. There's also an MSI Dragon Gaming Center app, but don't get too excited: It's little more than a CPU-temperature monitor with a built-in application launcher. 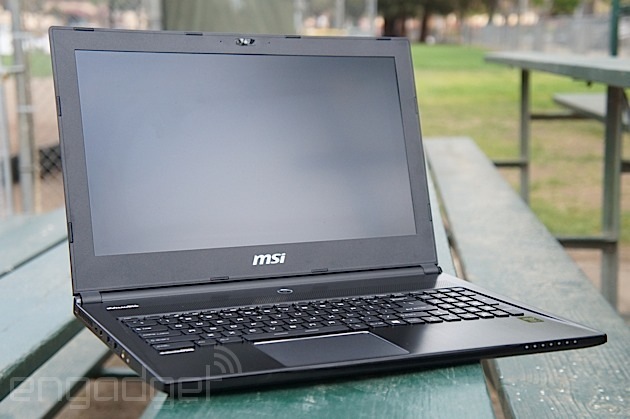 MSI's ultra-slim gaming laptop only comes in two configurations, and not much sets them apart. Our $1,800 review model houses an Intel Core i7-4700HQ processor, NVIDIA GeForce GTX 860M graphics (with 2GB GDDR5), 16GB DDR3L RAM and a 128GB SSD drive paired with 1TB of HDD storage. Knock $100 off that price and you'll get the exact same thing minus four gigs of RAM and 250GB of HDD space. There's also a third model in the works -- the high-resolution Ghost Pro we saw at CeBIT -- but MSI told us it won't be available for several months. Even so, it could be worth the wait: MSI's $2,100 model will boast GeForce GTX 870M graphics (with 3GB GDDR5) and a super-sharp, 15.6-inch 2,880 x 1,620 display. As fond as we are of the Ghost's slim, metallic frame, it does have at least one drawback: It's expensive. You don't have to look far to find a more affordable alternative with similar internals -- in fact, MSI has one. The Ghost's cousin, the GE60 Apache, matches our review laptop almost part for part, ringing in at $1,350, albeit with half as much RAM and a body that's twice as thick (thanks in part to optical media). Meanwhile, another $50 buys the GE70, with 12GB DDR3L RAM, an optical drive and a larger 17.3-inch screen. If you're willing to compromise, you've got plenty of affordable options. If your heart's set on thin, powerful and expensive, however, you'd be remiss to ignore the snake in the room: the 14-inch Razer Blade. This refreshed gaming portable not only matches the Ghost Pro's GeForce GTX 870M GPU, but also outpaces that model's 3K display with a 3,200 x 1,800 IPS multi-touch panel. It's even a hair slimmer than MSI's kit, flaunting its "thinnest gaming laptop" crown with a 0.70-inch frame. It only costs $100 more than the Ghost Pro, too. Like the Razer Blade, the Ghost plays to a specific niche: gamers who want the power of a full-fledged gaming PC without sacrificing portability or aesthetics. 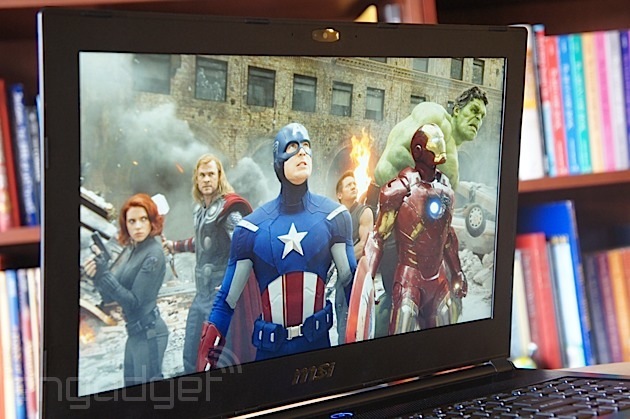 It's a small subset of the notebook market, but MSI's GS60 fits right in: It's thin, powerful and a joy to use. It's not perfect, though. Pitted against the Blade, the Ghost's average battery life is disappointing and its Kepler-based GPU fails to make NVIDIA's new Battery Boost feature shine. Its attractive design can also detract from its gaming roots, best exemplified by a trackpad that, while outstanding for an Ultrabook, feels out of place on a gaming machine. While these gripes are easy to dismiss, one more shadow hangs over MSI's GS60: the unreleased Ghost Pro configuration. It's everything the current model is and more, teasing enough upgrades to conceivably push the Ghost's performance off the fence of 30 fps gameplay. As is, the GS60 is a solid option for folks looking for a slim gaming rig, but a more powerful, identical machine is just around the corner. You want our opinion? Wait for the Pro model.